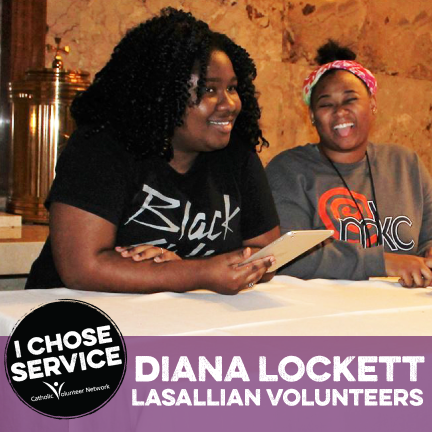 I first learned about Lasallian Volunteers my freshman year in college. Initially, I could not think about living in another city without family or some type of support system. So, I never gave the program another thought until the end of my junior year. I never made a concrete decision to be a part of the program until the first semester of my senior year. If I had not become a Lasallian Volunteer I would have continued my job at Creative Life, a faith-based non-profit organization assisting with low income families in South Memphis. Also, during that process I would have been trying to figure out what my next step, which is Graduate School. However, I chose a year of service. The big thing that caught my attention was being able to live in a new city. I have been in Memphis all of my life living in the same house since I was born. I just could not pass up on an opportunity that allowed me to live in a new environment with a huge amount of support during the process. It was difficult for me to leave my grandma behind and the non-profit organization that I have been a part of since I was in the 8th grade. I knew deep inside that if I had stayed in Memphis that I wouldn’t be happy and that it was time for to branch out and experience some things. During the Lasallian Volunteers orientation, I saw a quote that said, “A comfort zone is a beautiful place, but nothing ever grows there.” That quote has stayed with me this entire service year because it summed up how I felt when I decided to make this big decision to move to Chicago. I do not regret at all deciding to be a part of this program, I have met so many different types of people from different backgrounds. I am learning more about different cultures from listening to fellow LVs, De La Salle Christian Brothers and the staff at my placement, the Maria Kaupas Center. I have learned about Restorative Justice Peace Circles and how it is useful in helping students gain effective listening skills and allowing them to feel that they are being heard. I have seen beautiful scenery in Albany, New York during our Midyear retreat. I have a lot of interesting stories to tell about the encounters I have had on the public transit here in Chicago. I would say to anybody that I have definitely grown as a person in this program and I never plan to stop growing as a person. If anybody is considering doing service after college I would say do it. There is so much to gain from a year of service. You are not only gaining an interesting experience but you are also giving your talents and time to people that may have never received anything from anyone. It feels good to do the best that you can to make a person’s day better because you never know what they are dealing with on the regular basis at home. That beautiful place that you had in our comfort zone is definitely beautiful but you will never grow there. In the process of growing outside of your comfort zone you are helping others to grow with you. Now that is beautiful!